We’ve long framed collapsing crude prices as a battle between the Saudis and the Fed. Oil produced outside the Orgainsation of the Petroleum Exporting Countries (Opec) is slowing at its fastest rate in 20 years as lower prices hit higher cost producers such as the North Sea and US shale drillers, a leading energy think tank has warned. The Paris-based International Energy Agency (IEA) has said that lower production in the US, Russia and the North Sea would result in output outside Opec dropping to 57.7m barrels per day (bpd) in 2016. The majority of the declines would come from US light crude, which is expected to decline by 400,000 bpd. "The steep declines in US crude oil production seen since the end of June has created some optimism that we are now finally seeing that start of a steep decline," said Bjarne Schieldrop, chief commodities analyst at SEB. Oil prices have plunged 50pc this year with Brent crude trading well below $50 per barrel, a level which makes it uneconomical for many producers. Opec, under pressure from Saudi Arabia, has allowed oil prices to fall in an effort to protect its shrinking market share especially from the rise of shale oil drillers in the US. Oil prices have declined sharply over the past month to our $45/bbl WTI Fall forecast. While this decline was precipitated by macro concerns, it was warranted in our view by weak fundamentals. In fact, the oil market is even more oversupplied than we had expected and we now forecast this surplus to persist in 2016 on further OPEC production growth, resilient non-OPEC supply and slowing demand growth, with risks skewed to even weaker demand given China’s slowdown and its negative EM feedback loop. Given our updated forecast for a more oversupplied oil market in 2016, we are lowering our oil price forecast once again. Our new 1-, 3-, 6- and 12-mo WTI oil price forecast are $38/bbl, $42/bbl, $40/bbl and $45/bbl. Our 2016 forecast is $45/bbl vs. $57/bbl previously and forwards at $51/bbl. As we continue to view US shale as the likely near-term source of supply adjustment given the short cycle nature of shale production, we forecast that US Lower 48 crude & NGL production will decline by 585 kb/d in 2016 with other non-OPEC supply down 220 kb/d to end the oversupply by 4Q16. Got it. And just how low, in a worst case scenario, could crude go? This creates the risk that a slowdown in US production takes place too late or not at all, forcing oil markets to balance elsewhere or as they have historically cleared, through a collapse to production costs once the surplus breaches logistical and storage capacity. Net, while we are increasingly convinced that the market needs to see lower oil prices for longer to achieve a production cut, the source of this production decline and its forcing mechanism is growing more uncertain,raising the possibility that we may ultimately clear at a sharply lower price with cash costs around $20/bbl Brent prices, on our estimates. While such a drop would prove transient and help to immediately rebalance the supply and demand for barrels, it would likely do little for the longer-term capital imbalance in the market with only lower prices for longer rebalancing the capital markets for energy. The levers to force HY producers into lower production, such as borrowing basis redeterminations, debt maturities and hedge coverage, are significantly less binding for IG E&Ps. It is instead management’s focus on balancing capex and cash flow and investors’ willingness to finance funding gaps that are the levers of adjustments for this cohort of companies. 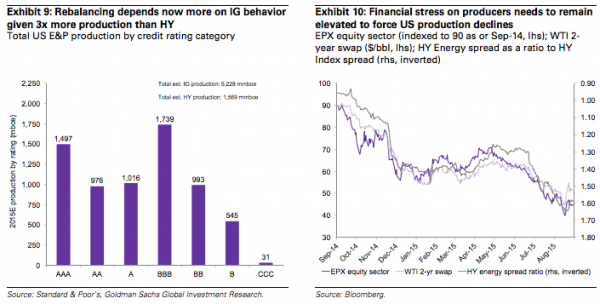 And while HY debt markets may be once again shutting, tentative signs of greater discipline by US IG E&Ps have so far only translated in stabilizing production guidance rather than pointing to the decline that our global oil balance requires. As a result, the sharp intensification in producer financial stress observed recently – with forward oil prices and energy equity share prices at multi-year lows (and credit spreads at highs) – is unlikely to yield sufficient financial stress in the short-term. So while this deterioration in financial conditions is finally reflecting the markets’ decreasing confidence in a quick rebound in prices and a recognition that the rebalancing of supply and demand will likely prove to be far more difficult than previously expected, we now believe that such stress needs to remain in place well into 2016 and up until evidence emerges that US shale production growth is actually required. And speaking of war, the obvious risk to any forecast that calls for sharply lower crude is that some mid-air "accident" in Syria takes the "proxy" out of "proxy war", in which case crude soars as Russia and Iran square off against a US coalition that would swiftly include Saudi Arabia in what would very likely be the precursor to a wider conflict the scope of which we haven't seen since 1939. Dividends may be cut, but with over coverage now yielding 6% on average this is becoming priced in. We expect returns and FCF to trough in 2016, and improve in 2017/18 driven by higher oil prices and falling costs. Even with this, valuations do not yet look compelling, but we move to a Neutral Coverage View from Cautious.